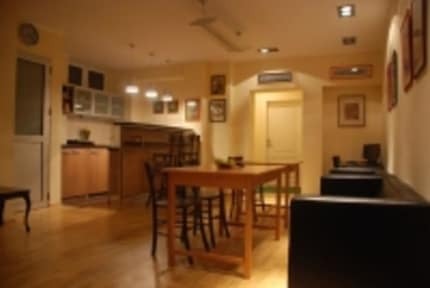 Hostel Jasmin i Beograd, Serbia: Bestill nå! FREE: internet, WI-FI, air-conditioning, coffee, tea, walking tours, bicycle parking, lockers, luggage storage, linen, towels (we are changing towels on a daily basis), laundry and ironing service, maps and brochures about Belgrade and more!!! 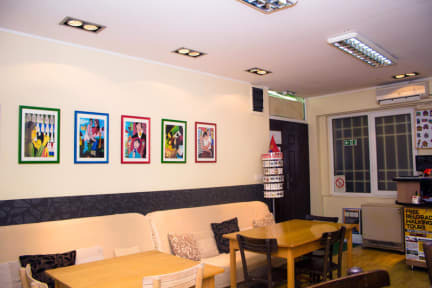 In order to provide you with cozy accommodation we are offering to you comfortable, spacious, air conditioned rooms with free Wi-Fi, computers with access to Internet and much more. The building is under video surveillance and security staff are on duty 24 hours a day. Our kind staff will gladly answer any queries the guests might have and advice them in planning their free time. The very downtown in which the Hostel is located five minutes from the center of city across the main bus station in CITROEN building (same line of Banca Intesa and Jum Inn hotel), enables you to get to Kalemegdan (the Medieval fortress), Knez-Mihailova Street (the pedestrians' zone) or Skadarlija (the bohemian quarter) in 10 minutes time, without the need to use the city transport (by walking). Vert helpful and Nice host when we got truble with our booking in another Hostel! Very good location, close to city senter. We got a big room. Not so clean, nyt very nice stay!